While Spanish food is one of my biggest loves, I am not one to turn down local fare in any of the places I visit. This meant wild boar tortellini in Florence, leubuckhen in Passau and even grasshoppers in China. A happy tummy means a happy Cat. When I was on a shoestring budget traveling around Europe, I typically ate street food and made sandwiches in hostels and splurged on one meal. Now that I have a big kid job, I find that a far larger part of my budget on eating and visiting local markets. Then my parents came to Europe and they offered to pick up the tab. As part of our package on our Viking Cruise down the Danube, we were offered the option of taking walking tours with local guides. As someone who has traveled independently for six years, I tend to stick to a map and my own intuition, but I found Viking’s guides to be knowledgeable and quite humorous. My most frequent question: Where do the locals go to eat? 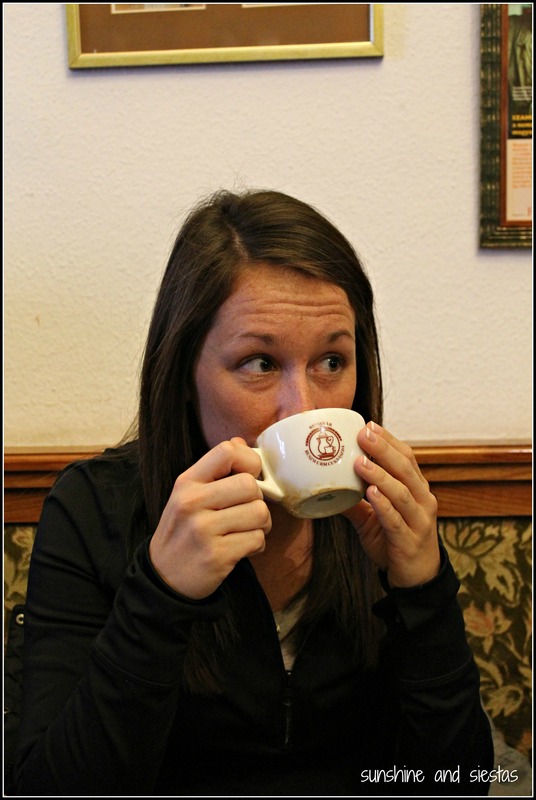 Our guide in Budapest, Julia, showed us around the Buda Castle area and directed us to the Ruszwurm, a nearly 200-year old coffeehouse that had retained its recipes ever since. Famous for strudel – apple, sour cherry and even nut – it’s one of the most frequented and most beloved of the Hungarian capital. When we walked into the cramped café, one of the other families on the cruise was leaving, so we snagged their seats and ordered an espresso for me, a cappucino for my sister, and an apple strudel and tiramisu to share. One thing you have to understand about my family is that we’ve all got a severe sweet tooth, so a certain amount of self-restraint was required to not get an individual pastry and fend off wandering forks. The strudel was heavenly, flaky on top and tart in the middle. Our bill for two coffees and two cakes came out to 9€ (most places in Budapest accept euros). 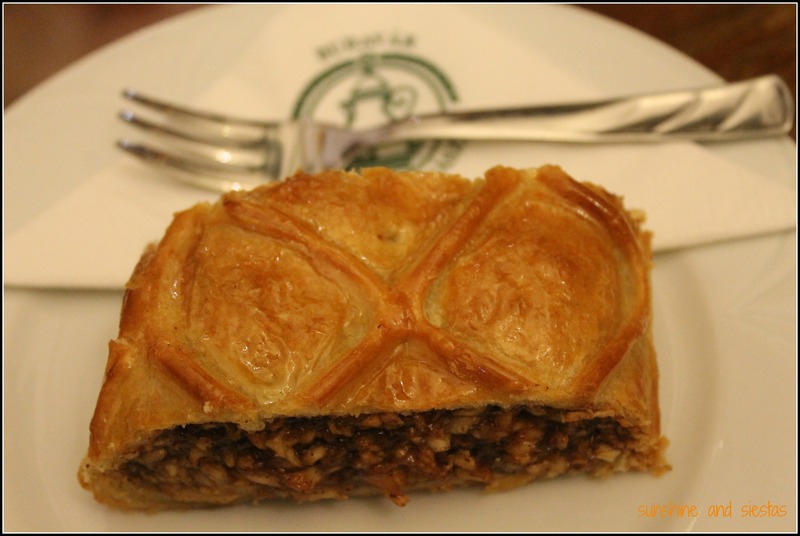 Warm apple strudel? These are a few of my favorite things. 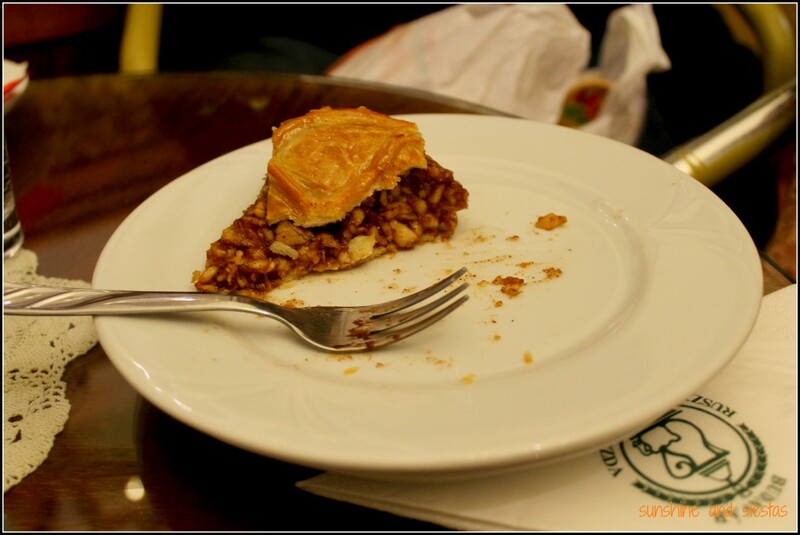 Marek told us that we should wait until Vienna for apple strudel. Or, you could just wait until Ruszwurm. If you go: Ruszwurm is located at Szentháromság utca 7, just steps from the St. Stephen’s Cathedral on the Buda side of the Danube, and is open daily from 10a.m. until 7p.m.